On a rainy fall morning, transportation directors, lawmakers, and the media gathered at the Center for Advanced Product Evaluation (CAPE) to witness a once in a lifetime crash test demonstration. 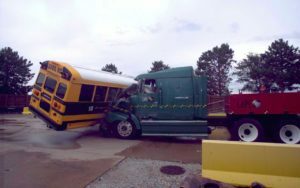 A semi-truck traveling 30 mph slammed into the side of a school bus right before their eyes. Inside the bus were unbelted and belted “students,” and when the crash was over, many attendees looked at seat belts on school buses in a whole new light. One unrestrained test dummy was fully ejected, traveling diagonally across the bus and out a closed window. Another was partially ejected. 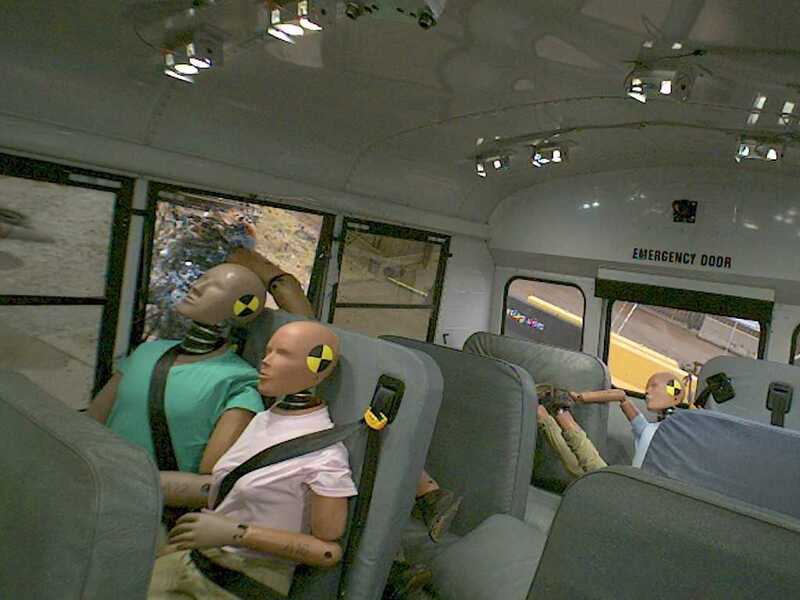 The students wearing three-point lap-shoulder belts in the new SafeGuard FlexPlus seats remained safely in their seats. The demonstration was a vivid reminder that compartmentalization fails in side impact crashes and rollovers. That’s why organizations like the NTSB, NHTSA, NASDPTS, and The Academy of Pediatrics all recommend three-point seat belts on school buses. Adding seat belts not only save lives, they can also significantly reduce injuries. 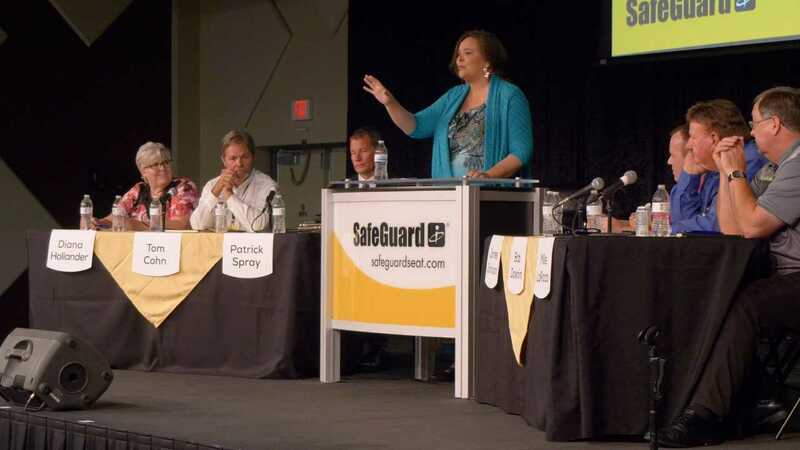 The accident recreation was part of the SafeGuard Seat Belt Safety Summit, an event designed to bring together industry leaders to discuss their firsthand experiences with seat belts. 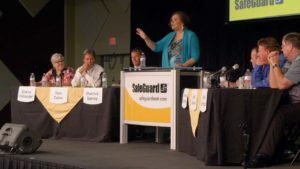 The expert panel shared how installing seat belts has dramatically improved behavior on their school buses, and how that led to an increase in driver satisfaction and retention. They also dispelled a number of myths, such as adding seat belts reduces capacity, slow evacuations, and that belts will be used as weapons. Attendees had the opportunity to ask a number of questions of the panel. 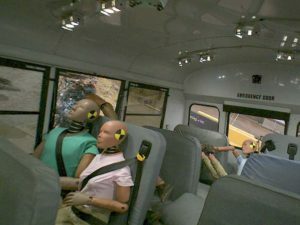 Once the summit was over, many concluded the evidence was overwhelming, and that the time had come to add seat belts to their own school buses and to mandate their use. “Districts have the authority to make policies, and (each state’s) department of education has the authority to make policies, and we are going to mandate that drivers encourage children to wear their seat belts. Especially after this crash test today,” said Diana Hollander, President of the National Association of State Directors of Pupil Transportation Services. Good Morning America was on hand for both the crash demonstration and summit, and shared the story with viewers over the fall. The broadcast got more people talking, and now more districts than ever are thinking about making the leap to a more active form of protection by adding three-point lap-shoulder belts. The SafeGuard Seat Belt Safety Summit marked the premiere of SafeGuard’s new FlexPlus seat which was used during the crash demonstration. The FlexPlus is the only seat with features like SmartFrame Plus to enhance compartmentalization and the TattleTale indicator. The seat is designed to be best in class in performance, quality, testing, and durability. Learn more about the SafeGuard FlexPlus here. You can watch the Good Morning America segment as well as the full SafeGuard Seat Belt Safety Summit below.